Below you will find crafts which are general fall crafts and are great projects for both Halloween and Thanksgiving. I'm sure you will find these projects to be a great addition to our ever growing Halloween and Thanksgiving craft categories. This simple fall wreath can be made quickly with no gluing. Our simple Hot Pad makes a great addition to any holiday table and is fun and easy for kids to make. This craft also helps teach recycling. Dress up your Thanksgiving dinner table with hand made napkin rings craft from craft foam. Fun kids craft project. Easy kids craft, this wreath is made of craft foam. Kids will love to craft this snow globe from construction paper! Show off your scarecrow by displaying him in a potted house plant. Simply made from craft sticks, raffia and a Styrofoam ball. 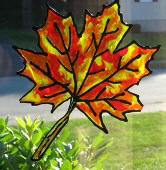 Learn to make your very own window clings with instructions, paint information and our leaf pattern. Make an scarecrow with an apple head to display in a plant. Cute alternative to a traditional scarecrow. Hot apple cider or hot chocolate will be so much more fun to drink when served on these handmade leaf coasters. Easy craft to make with kids that they can wear all season long. Made of craft foam. Make a family of these Leaf Magnets for your refrigerator or for your favorite teacher. This easy fall craft is too cute to pass up.